This magnificent historic estate designed by famed architect George W. Maher is located in the Hutchinson Historic District. 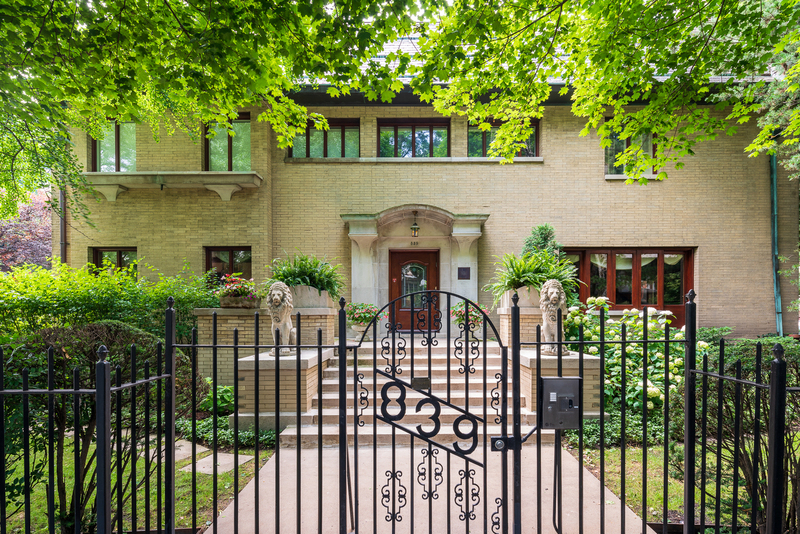 Sited on a 14,735 Sq Ft corner lot w/an attached 4 car garage, this remarkable 3 level Prairie School style residence offers 5 BRs, 5 full + 2 half BAs & over 10,000 Sq Ft with exceptionally large rooms. Original mahogany wood paneling, oak floors, art glass double doors & central air throughout. Original Butler's Pantry leads to stunning DeGuilio Kitchen w/limestone counters & separate eating area. 48" Sub Zero, 48" Wolf range, 2 Miele DW's, freezer drawers, wine cooler, warming drawer. Gracious separate LR & DR's, each w/marble & mahogany WB FPL's. Library overlooks expansive, skylit 1.5 story Family Rm. Sun drenched Solarium opens to large rear yard. 2nd Level has corner Master Suite w/Sitting Room & FPL, luxurious spa Master BA, w/Carrera marble, custom closets, heated floors, & steam shower + BR2 w/en-suite BA. 3rd Level offers 3 more BR's + 2 full BAs.